With state-of-the-art, minimally invasive Dental Implant procedure you never have to wear dentures again. As we age, the loss of one or multiple teeth happens very often. Fortunately with today’s advances in dentistry, tooth loss can doesn’t have to be permanent. 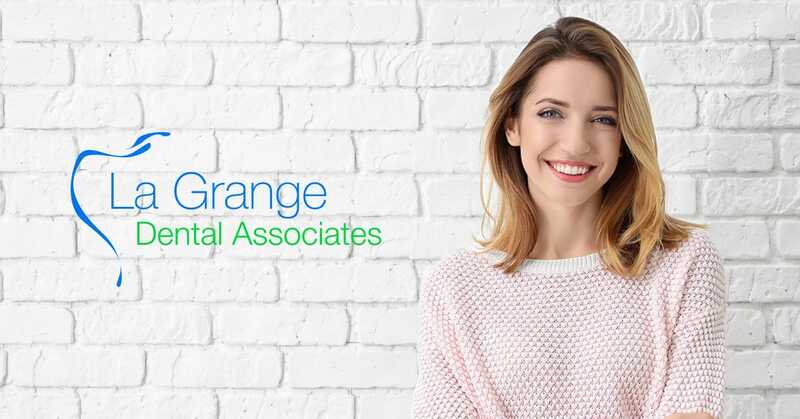 At La Grange Dental Associates, we replace your lost or damaged teeth with dental implants that look and feel completely natural. Imagine that you can eat all the foods that you used to but have been avoiding because of your limitations caused by tooth loss or uncomfortable dentures. The All-On-4 dental implant procedure is a full mouth teeth replacement technique that is capable of giving patients new teeth in one day! This procedure is used when a patient needs all of their upper and/or lower teeth replaced. Teeth may need to be replaced because they are damaged or missing. Your doctor in La Grange, IL will perform the placement of implants while you are comfortably relaxing, slightly sedated, or asleep depending your preferences. In most cases patients will leave the office with a new beautiful smile the same day! Schedule a complimentary evaluation with your doctor to see if you are a candidate to replace your teeth in a more natural way. We offer affordable teeth replacement and interest free financing options. This type of treatment is an innovative procedure, that utilizes only four to six dental implants to provide patients natural looking and permanent, fixed teeth. Unlike dentures that require adhesives and have to be removed daily, your new teeth will be permanently fixed in your mouth, and they will look, feel, and function just like natural teeth. Your doctor in La Grange, IL is a highly trained and experienced implant surgeon who received extensive training in not only placing implants but treating the surrounding gum and bone tissue. Before placing the implants Dr. Ivan designs a custom treatment plan to ensure the final result looks and feels natural as well as functions optimally. Every patient is thoroughly examined and we take high resolution digital images with our state-of-the-art 3D dental CT scanner. Thanks to today’s advanced technology, we virtually plan the entire surgery with a special dental software even before the patient gets in the chair. By identifying exactly where the nerves are and the size and quality of the bone on the computer, the placements of the actual implants precise, quick and minimally invasive. This way patients are comfortable during the relatively short surgery. For those who are anxious about the procedure we offer different sedation options. If you believe you can benefit from the All-On-4 dental implant procedure or would like more information, call our La Grange, IL dental office today to make an appointment!